I recently was given the opportunity to try Wen Conditioner. To be honest, I didn't really know what to expect and I was pleasantly surprised. Wen Conditioner is not your typical conditioner. It isn't some crappy moisturizing cream that you put on after shampooing. No, Wen Conditioner not only replaces your current conditioner....but it replaces your shampoo too. That's right...you do not shampoo before using this! I admit I had a hard time getting this concept to sink in. We have been raised to use shampoo and conditioner together. It is typically okay if you leave off the conditioner, but not the shampoo. So, why doesn't Wen just call itself shampoo? Because it isn't. Celebrity stylist Chaz Dean (who by the way has REALLY beautiful hair!) 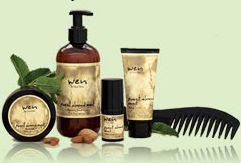 designed Wen Conditioner because he was tired of the damaging effects that shampoo has on hair. Go here to read more. This set retails for only $29.95 plus shipping on the Wen website. What a steal! I also just found out that you can buy products individually & in varying scents on Amazon (see widget at bottom of page). So, I proceeded to read the directions and I jumped into the shower to test my Wen Conditioner. The first thing I loved was the scent. The Sweet Almond Mint scent is amazing. It is soft and sweet. When I first pumped it into my hand I was a little worried because it felt heavy and you had to use a lot. Then I proceeded to rub it into my scalp with a little bit of water. I was in heaven! The Mint actually makes a slight tingly feeling on your scalp (almost like some menthol dandruff shampoos...only better). My hair instantly felt clean and I even felt revitalized from the mint. When I got out of the shower my hair felt soft and had more volume than normal. I realized I was in love! A few days after initially using Wen I got really sick with Food Poisoning and didn't want to leave my bed/toilet, not to mention get a shower. So, I skipped a shower that day. I almost never do this because I have really oily hair that drives me insane if it isn't washed within at least 24 hours. Well, I noticed that my hair wasn't near as greasy as it normally is! I was able to go all day without a shower and not feel disgusting. Major brownie points for Wen. I also tested the other products that they sent me. I received Wen Styling Creme, Wen Re moist Intensive Hair Repair Mask, Wen Texture Balm and a Wen Wide Tooth Shower Comb. I love all the products, but most of them I find unnecessary since the Wen Conditioner does such a fantastic job. The Comb is perfect for evening out the conditioner in the shower. I used the styling creme to give my hair a little extra shine and body. The texture balm I actually used to refresh my hair at work after a long night (there is one day a week where I work 13 hours). My hair is not very damaged since I haven't dyed it in a while and I don't use a hair dryer, but I still tried out the Hair Repair Mask. It made my hair feel even more silky. These products are fantastic! Disclaimer: I received the Wen Healthy Hair Care System in exchange for my honest review. I was not compensated in any other way. The opinions and thoughts expressed are my own.
" @Latsyrc728 has a Wen Sweet Almond Mint Conditioner #Giveaway (ends 03/15) http://goo.gl/fb/jXAd #contest Please RT!!" Giveaway ends 3/15/10 at 9pm EST. Giveaway is for US residents only. Winner will be chosen randomly. Winner will be contacted via e-mail and then will have 48 hours to respond before a new winner will be chosen. I would love to try the conditioner! I have long hair and use a TON of shampoo and conditioner. It would be great to only need to use one product. I entered the Hippie Wicks giveaway. I've seen these products on tv! I'd love to try them, particularly the Hair Repair mask. I follow via Google Friend Connect - Lydia A. Entered Country Bob's sauce giveaway. I would love to try this stuff! I totally am dying to try the balm in the jar! I'd love to try the Cleansing Conditioner. The hair repair mask sounds good! And my often colored hair might need it! I would love to try the hair repair mask. I have whats called horsey hair!!!! I need help!!!! The WEN® Re Moist Intensive Hair Repair Mask sounds fabulous! I would love to try the Moist intensive. My hair is uber dry! 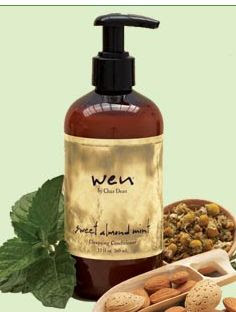 I'd like to try the Wen tea tree cleansing conditioner. I would love to try the cleansing conditioner. I am most excited to try the Re Moist Intensive Hair Repair Mask! I follow you with google friend! The Intensive Repair Mask would feel great for my Damaged hair!